I have just discovered a new term that heavily relates to my work with “Fragment Storytelling” and indeed much storytelling in games. An Epistolary Novel is a Story that using letters of documents to tell the story. Maybe the most famous of the genre is Dracula but I am also a fan of 84 Charing Cross Road. 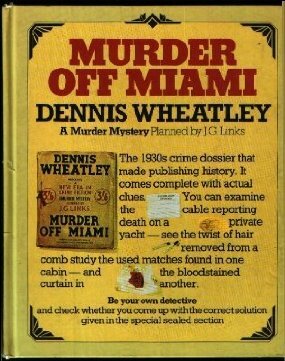 I also have an amazing “Whodunnit” book, called Murder off Miami weirdly by Dennis Wheatley, where the letters and documents are fully reproduced on different papers and types. Including photographs from the Crime Scene and an envelope at the end that contains the solution. HE produces 5 of these and I must try to collect them all! In games letters or books are often used to tell the story. A good example being the Elder Scroll series, Morrowind, Oblivion and Skyrim being the most recent. Some young gamers probably dont bother with all this reading material, but I love it, and devour all! In “Somewhere on the road to Hell” I will also be using this technique extensively, especially as I want to keep dialogue to a minimum (both for technical and atmosphere reasons). The game starts (usually) with a letter of introduction to the valley in Norway, from your employer. during the game there will be many subtle hints that can be read or discarded. INdeed, if there is a goal at all to the game, its to find out as much as you can. The actual game mechanics (which can´t really be revealed) will mean that it is in fact impossible to play the game once and learn everything, how ever much you try, and you will have to play again a number of times to kind of see the events from other angles… One play may even contradict another play, so coming out with a defining “this is what happened” will be impossible. More that “This is what happen this time”. Previous PostHow much can you ever really know?Next PostOperating Theatre Update.